In a host of consecutive bestsellers, Jonathan Kellerman has kept readers spellbound with the intense, psychologically acute adventures of Dr. Alex Delaware–and with excursions through the raw underside of L.A. and the coldest alleys of the criminal mind. Rage offers a powerful new case in point, as Delaware and LAPD homicide detective Milo Sturgis revisit a horrifying crime from the past that has taken on shocking and deadly new dimensions. Troy Turner and Rand Duchay were barely teenagers when they kidnapped and murdered a younger child. Troy, a remorseless sociopath, died violently behind bars. But the hulking, slow-witted Rand managed to survive his stretch. Now, at age twenty-one, he’s emerged a haunted, rootless young man with a pressing need: to talk–once again–with psychologist Alex Delaware. But the young killer comes to a brutal end, that conversation never takes place. Has karma caught up with Rand? Or has someone waited for eight patient years to dine on ice-cold revenge? Both seem strong possibilities to Sturgis, but Delaware’s suspicions run deeper . . . and darker. Because fear in the voice of the grownup Rand Duchay–and his eerie final words to Alex: “I’m not a bad person”–betray untold secrets. Buried revelations so horrendous, and so damning, they’re worth killing for. As Delaware and Sturgis retrace their steps through a grisly murder case that devastated a community, they discover a chilling legacy of madness, suicide, and multiple killings left in its wake–and even uglier truths waiting to be unearthed. And the nearer they come to understanding an unspeakable crime, the more harrowingly close they get to unmasking a monster hiding in plain sight. 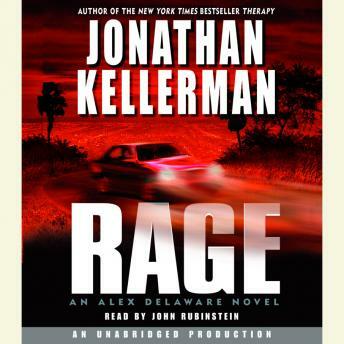 Rage finds Jonathan Kellerman in phenomenal form–orchestrating a relentlessly suspenseful, devilishly unpredictable plot to a finale as stunning and thought-provoking as it is satisfying.